Posted by youngm2015 in Friends, Genealogy / Local History. We have some really wonderful, hard-to-find and hard to replace reference books in our popular genealogy and local history section of the Steele Memorial Library. 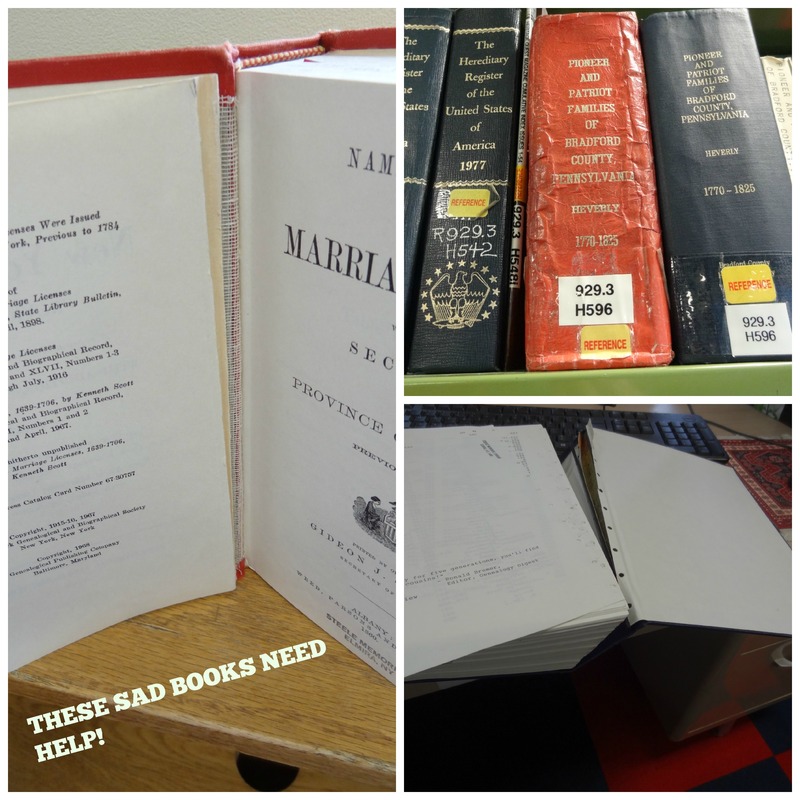 But, even if these books don’t leave the library, they have seen a lot of use over the years. Many are in disrepair, and quite a few could be repaired, but were beyond what we could to do to responsibly repair them in the library. We needed to send some out for a complete rebinding, but our small budget couldn’t possibly begin to cover the cost. The Chemung County Library District Friends made it possible for us to send the books in the most dire need of rebinding out to a professional bookbinder. They came back in this week and they are like brand-new books! Some titles that were falling apart but now are in wonderful new bindings: “Refugees of 1776 from Long Island to Connecticut”, “History of Waverly, NY”, “History of Bradford County, PA”, and “Thirty Thousand Names of Immigrants to Pennsylvania from 1727 to 1776”, among others! As a special bonus, we can now offer to our patrons for the first time a 4-volume set of the Genealogy of Early Connecticut families. This was donated to us but we couldn’t put it on the shelves due to its deteriorating leather covers. They are now in pristine condition and able to be used by our researchers. As a genealogy and local history department, we have two main mandates regarding our collection. The first to acquire items that will be of use to people researching genealogy and local history. The second is to maintain these items in a responsible way to ensure that library patrons 100+ years from now will have access to this important and hard-to-obtain information. 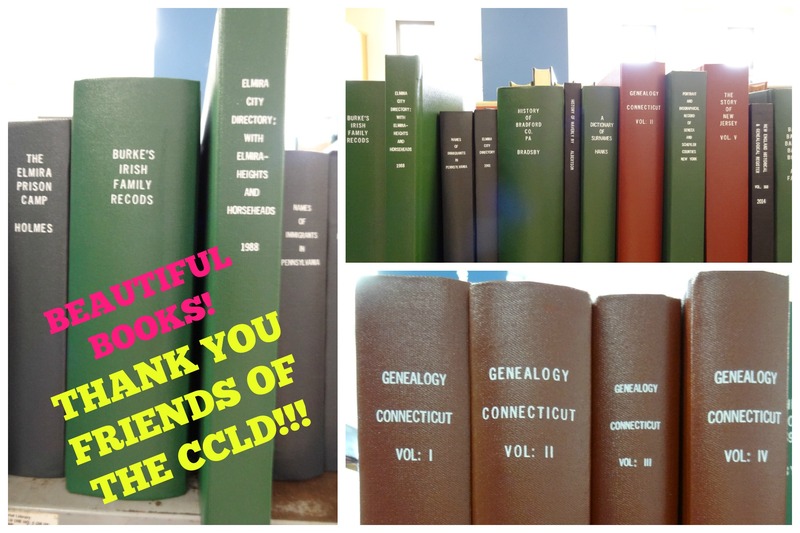 Thank you, Friends of CCLD, for helping us keep our collection healthy. We couldn’t have done this without your help. Posted by CCLD in Friends. The Friends of the Steele Memorial Library will be holding its annual book sale at the Arnot Mall over two weekends in February 2012. Thursday February 9-Sunday February 12, and Thursday February 16- Saturday February 18, with a bag sale on February 18. This year the sale will be held in he area by the JCPenney store. There will be a large variety of books, from children to adult, fiction sports, paperbacks, biographies, and much more. The prices of the books range from $.50 to $3.00. Last year the sale took in over $25,000 which was used for the library to fund programs and learning material. Posted by CCLD in Community, District News, Friends, Steele. Elmira, N.Y. — Calling all book lovers! The Arnot Mall will host a massive book sale over two weekends in February: Feb. 10-13 and Feb. 17-19, 2011. The annual sale, a favorite community tradition for nearly 40 years, is sponsored by the Friends of the Steele Memorial Library. All proceeds from the sale will go toward library materials and programs, as well as community literacy initiatives. Thursday, Feb. 10: 10 a.m.- 9 p.m.
Friday, Feb. 11 10 a.m.- 9;30 p.m.
Saturday, Feb. 12: 10 a.m.- 9;30 p.m.
Sunday, Feb. 13: 11 a.m.- 6 p.m.
Thursday, Feb. 17: 10 a.m.- 9 p.m.
Friday, Feb. 18: 10 a.m.- 9;30 p.m.
Saturday, Feb. 19: 10 a.m.- 9;30 p.m.
Thousands of hardcover and paperback books, CDs, DVDs, VHS tapes, LPs, and audiobooks — all donated by members of the community — will be offered for sale. Items will be available in a huge range of categories including fiction, biography, cooking, children’s, home repair, sports, antiques, poetry, religion, self-improvement, and much, much more. The best part is that everything will be sold for $3 or less! Saturday, Feb. 19, will close out the sale with a special “bag sale”, where $3 buys all that you can fit into a shopping bag. Cash and checks will be accepted as payment on all days of the sale. Donations of used books may be dropped off at the Steele Memorial Library, located at 101 East Church Street in downtown Elmira. Please note: books should be in good condition; textbooks, magazines, Reader’s Digest condensed books, and encyclopedias will NOT be accepted. The Friends of the Steele Memorial Library have hosted an annual book sale for nearly 40 years. Though it came from humble beginnings — books were once stored in volunteers’ garages between sales — the sale now has its own dedicated storage area and books are transported by the tractor-trailer load. The Friends of the Steele Memorial Library is a group of over 350 committed local volunteers who help stimulate public support and use of the Steele Memorial Library and its branches. In addition to the annual book sales, the Friends also sponsor a variety of activities — including read-aloud programs, book review events, and the Kinderbook program — and host an annual poetry festival. The Arnot Mall is located at 3300 Chambers Road South between Horseheads and Big Flats. Visitors can take I-86/Route 17 to exit 51A. For a map of the mall, please visit http://www.arnotmall.com. For more information on the book sale, the public may contact the Steele Memorial Library business office at 607-733-8607 or visit the library’s website at http://www.ccld.lib.ny.us.